Heat oven to 350°F. Lightly grease cookie sheet with shortening or spray with cooking spray. In large bowl, beat sugars and butter with electric mixer on medium speed about 3 minutes or until creamy. Beat in maple flavor and eggs. Stir in flour and baking powder. Stir in walnuts. Divide dough in half. Shape each half into 10-inch roll. Place rolls 5 inches apart on cookie sheet; flatten to 3-inch width. Bake 20 to 30 minutes or until set and edges begin to brown. Remove from cookie sheet to cooling rack. Cool 10 minutes. With serrated knife, cut rolls diagonally into 1/2-inch slices. Place slices cut side down on ungreased cookie sheets. Bake 5 to 10 minutes or until lightly browned and dry. Turn cookies over; bake 5 to 8 minutes longer or until lightly browned and dry. Remove from cookie sheet to cooling rack. Cool completely, about 15 minutes. Stir oil into melted candy coating; drizzle over biscotti. Let stand until coating is dry. Store in tightly covered container. These dunkable cookies are great with a cup of hot apple cider or cinnamon-spiced tea. 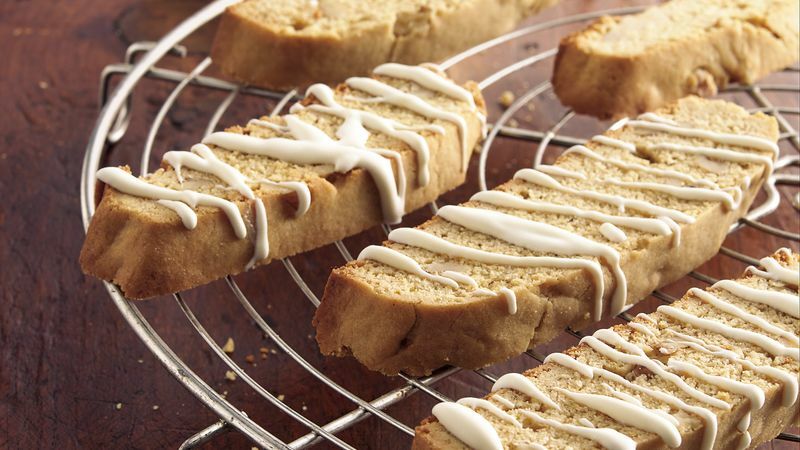 Instead of drizzling the biscotti, dip one end into the melted candy coating.